The venerable happy face mug has been a perennial best seller since the sixties when it was first introduced. 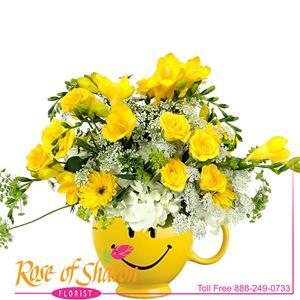 It is once again very popular and we have re-designed ours with an updated look using flowers more popular today. In the sixties it was filled with daisies and today the preferred is roses and hydrangea. Either way, it just brings a smile to your face.